Our JPG and PDF products can be downloaded immediately after ordering, and are sent to you via email as an attachment. Both products require a viewer to see the product. Open my PDF or JPG Attachments? Open and Print My JPG files? Open and Print My PDF files? Print My JPG files From Internet Explorer? Personalize the PDF Family Tree Template? Save the PDF Family Tree Template? Print the PDF Family Tree Template? I'm missing the bottom banner of my JPG COA (Coat of Arms/Family Crest)? Why didn't I get my JPG/PDF Attachment? How big can I enlarge the JPG COA image? With the image opened: Right-click (Windows) or click-hold (Mac) anywhere on the image to see options for saving, printing etc. Right-click (Windows) or click-hold (Mac) anywhere on the attachment. Choose Save Image As..., Save As..., or Download Image to Disk from the POP-UP menu. When the Save window appears, specify where you want the image to be saved. TIP: Saving the image to your desktop will make it easier to find later. Double-click the saved file to launch Windows Picture and Fax Viewer. This is often the easiest and fastest way to print or edit your image. Immediately after ordering, you can Click the Download Now link. Your order should appear in a new window. Right-click (Windows) or click-hold (Mac) anywhere on the image. NOTE: If click-holding doesn't bring up the pop-up menu, try pressing the Ctrl key and click-holding simultaneously. When the Save As... window appears, specify where you want the image to be saved. TIP: Saving the image to your desktop will make it easier to find later. Double-click the saved file or the attachment that came in an email message. This will probably launch Windows Picture and Fax Viewer. This is often the easiest and fastest way to view and print your image. Your file will open in a default application for your computer. This may be a graphics program (such as Adobe Photo-Shop) or it may be Internet Explorer. To print the opened file choose the printer icon. This launches a Photo Printing Wizard. We find that Internet Explorer is not the best way to print these, and suggest using another graphics program. Double-click the saved file or the attachment that came in an email message. Your file will open in a default application for your computer. Most likely this will be Acrobat Reader. PDF files require Adobe Acrobat Reader. This is a Free download from Adobe. To print the opened file choose the printer icon. This will generally bring up the Adobe printer dialog, which includes a preview of what will be printed. I get and error 'bad encrypt dictionary' when I try to open the PDF. Solution: Older versions of Adobe Acrobat Reader do not support encryption. Download and install the latest Acrobat Reader and the file will open properly. This is a Free download from Adobe. Part of the document is missing or the fonts have been lost. Solution: This problem usually occurs when the download was interrupted by either a slow internet connection or when the user tries to open the document before the download is complete. Download the PDF a second time and allow the document to be completely rendered and previewed before you try and navigate through the PDF. All I see is black background with no text or graphics. Solution: (August 16, 2011) This is a relatively new problem with the latest Acrobat Reader. Resizing the Acrobat dialog forces a refresh of the PDF, thus correcting the preview. You can resize and manipulate these images as you would any	of your other images or photos. You could even use a text	editor such as Microsoft Word if you wish to include the image in a document. Using Windows Picture and Fax Viewer, you can resize from the right click menu, or by choosing Edit (launches Paint). We often suggest that you let your printer do the re-sizing. At the end of the Windows Fax Viewer Photo Printing Wizard you can preview and choose sizes. 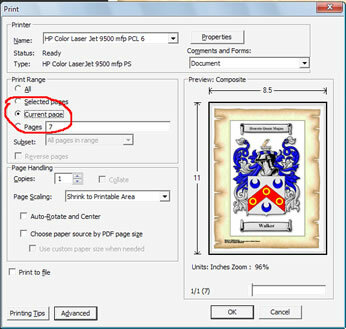 Your printer should let you choose your page/paper size, and then choose an options which allows you to print to fit. Unfortunately, we cannot give instructions, as this varies with each and every printer. Want to resize the image for use in other ways? Use Image editing software like Corel PhotoPaint, Adobe PhotoShop or download Gimp one of the best free Windows image editing software around. I'm missing the bottom banner of my JPG COA? Missing the bottom banner on a coat of arms print can occur sometimes when printing from Internet explorer. If you save the image to a location (Right Click > Save Picture As), and then double Click on your saved File. It will most likely open with Windows Picture and Fax Viewer, which will print it properly. You can also open your JPG files with a graphics programs such as Adobe Photoshop,or a use text editor such as Microsoft Word. Internet Explorer users: From Print Preview, choose a size (85%) which lets you see the bottom banner. We have found we can easily fill an 11x17" page with our 150 dpi image with very little loss of quality. If you are comfortable with your graphics (photo-shop) program, you can resize and manipulate these images as you would any of your other images or photos. We generally suggest that you let your printer do the re-sizing. (Images tend to be less pixillated this way). From your printer's options choose your page/paper size, and then choose an options which allows you to print to fit. Unfortunately, we cannot give instructions as this varies with each and every printer. SPAM filters sometimes block an unknown email sender, email with an attachment or something in the email that the SPAM filter believes is bad. Adding customerservice@houseofnames.com to your address book/buddy list will usually ensure that our emails are received. Be sure to check your SPAM folder. Invalid email address was submitted with your order. If you placed your order by PAYPAL, we process these orders the next business day. To print the opened file choose the printer icon (or use the file menu). This might bring up your printer dialog, or it may begin printing right away. To make some printer choices, click on Preferences. From the Internet Explorer Print Preview, you can choose a size (we suggest 85%). We find that Internet Explorer is not the best way to print these, and suggest using Windows Picture and Fax Viewer or another graphics program. Open your family tree template file. It will open for you in Acrobat Reader. Have your family members' names handy. Using your mouse and keyboard, you can type family members' names into your PDF Family Tree Template for printing or for later use. Click the first box you want to fill in, and type the person's name. We suggest that you start with your name or your spouse's name, above and below the tree, and “branch out” from there. If some of the names are long, the font size will reduce accordingly. Press Tab to go to the next field. Save a "blank" copy of the PDF Family Tree Template for future use or for other families. Remember where in your computer you have saved the file. Note: Your personal entries and the template are saved as one file. Pass it on - yes, this file can be emailed to your family for them to add or edit. Select your printer, and any settings that you want. Suspected cause of the problem: As our PDF files can be quite large, some printers cannot print the whole document without running out of memory.